The Commuter Backpack is a great alternative to a messenger style bag, saving your back by distributing weight more evenly. Waterproof 2-layer design: outer ballistic nylon layer wears like iron; replaceable waterproof liner keeps contents dry. Waterproof rolltop huge main compartment with removable liner and handy outer compartments. I have been using the Large for an entire Portland winter and have been very happy with it. The main compartment stays dry in even the most torrential downpours. The removable liner is great not only because it is replaceable, but because I can put dirty or wet items like booties between the liner and the bag and they don't affect my clean items - just don't forget or you will find a nice surprise later. The outer pocket keeps all my small items like wallet, keys, tools, spare tube, pens, etc. Thanks to the main flap also being waterproof, the compartment stays pretty dry unless the bag is too full and the flap doesn't completely cover. The side open pocket is perfect for a mini u-lock. Durability has been good although will probably not be as good over the long haul as way-more-expensive bags. Having used a messenger style bag for years, it is nice to have a spine friendly backpack-style bag. Overall, I think this is a really good bag for the money. Well made, sturdy, with a waterproof liner. Could use one more pocket on the front. This backpack is great my original bike bag was a messenger bag, so it was definitely a little bit of a switch. Personally, the bag's greatest asset aside from the rock-bottom price is the design. The mini u-lock holder makes locking and unlocking your bike no longer a hassle it's got a loop so that you can stick a light on the pack instead of the bike and so that the cops won't give you a ticket and a cell phone holder I've yet to find another bag that comes stock with a cell phone holder. Below the flap, there is a zipper pocket and a velcro pocket great place to store a tool or anything else you might have and 3 pen holders, so you can feel all messenger-y. It's definitely waterproof, and if it can survive Portland rain, then it'll survive anywhere! And for $80.00, you won't find a better deal anywhere. 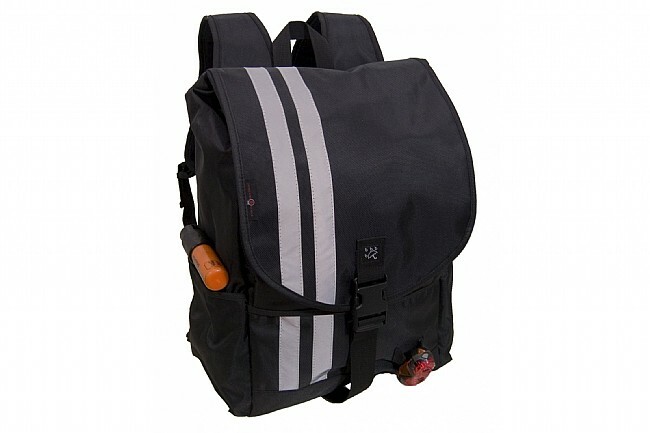 If you're looking for a great cycling backpack, then this it! If you're looking for a messenger bag, then BTD carries the Banjo Brothers Messenger Bag, and that is it! Great waterproof bag with some durability issues. This is my second Banjo Brothers commuter backpack. I use it every day, and it is very comfortable and keeps my things dry in any weather. My only issue is durability. I have replaced the waterproof liner on my bag every year (holes eventually occur on the fold lines), and I am replacing the bag itself after 3 12 years because the lining (as distinguished from the removable liner) is coming apart. It is made in China so maybe that's it, but Banjo Brothers has been very good to me so I'm going with the same bag again. It could be that this is normal wear, I do use it vigorously every day. It has one zippered pocket so you can store some things you need to get to without unfolding and going into the main bag, and it has a convenient side pouch for sunglasses. One loop on the back is a great place to clip a blinker. This bag is just right. Exellent product for you daily commute! I first bought the backpack last year after seeing a slick YouTube video displaying the waterproof capabilities as well as the extra pockets (which most of the high end bags don't offer). The price was right so I gave it a shot. One of the best bike purchases I've ever made. Since then I've bought one for my wife and for my father-in-law. Both are avjd commuters. Initially this bag looked big. But it ended up being perfect size for my commute. I am only 5'6 and it feels great on my back. I love the reflective strips...anything to help me be seen at night. I also like the multiple pockets but wish that they could somehow be more waterproof although they are covered by the main flap. I did not give it five stars waiting to see how it holds up in heavy rain.